After four years in prison, Nay Phone Latt was finally released in January 2012. A Myanmar blogger was arrested by the Myanmar government after promoting democracy, freedom of expression and the condition of the country. Yangon Technological University’s graduate keeps protesting and resistance against the Myanmar government. Latt, 32, who set up a blog in 2007, immediately grabbed the headlines. Myanmar was getting into the spotlight at that time. Latt was then arrested and sentenced to 20 years and 6 months imprisonment. Latt was listed on the list of “100 heroes in 2010.” Finally, he was released last year. His freedom came as welcome news to the bloggers in the country. They had a small party for Latt – complete with cake! Latt is one example of a blogger who deprived. Some bloggers in Southeast Asia have also suffered a similar fate. In Vietnam, the famous blogger Nguyen Van Hai was sentenced to two years in prison. Together with Van Hai, a former police woman, Ta Phong Tan, was given 10 years in prison. 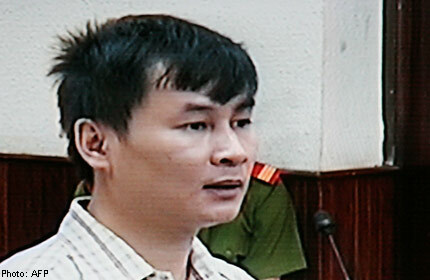 Then there was Phan Thanh Hai, who was sentenced to four years in prison. Both had published a number of posts on the Internet that criticized the government, as was reported by BBC in Bangkok. Three blogs belonging to those who often criticized the government were also forcibly closed. The third arrest was criticized by the blogger rights institutions, western governments, and the UN Human Rights Commission. The cases of Latt, Van Hai, Ta Phong Tan and Phan Than Hai certainly bothered us. Therefore, freedom of opinion and information is the right of all people. Including through the writing as that of the blogger. A human rights organization based in London, ARTICLE 19, again is reminiscent of expression rights of UNESCO World Press Freedom International Conference 2013 this month. ARTICLE 19 issued a ‘paper’ that contained the rights of bloggers. In essence, bloggers should be protected as well as journalists. ARTICLE 19 argues that it is no longer appropriate to define journalism and journalists by reference to some recognised body of training, or affiliation with a news entity or professional body. On the contrary, ARTICLE 19 believes that the definition of journalism should be functional, i.e. journalism is an activity that can be exercised by anyone. Accordingly, it argues that international human rights laws must protect bloggers just as it protects journalists. The policy paper, therefore, addresses the key areas that bloggers are likely to face, that is: licensing, real-name registration (vs. anonymity), accreditation, the protection of sources, protection from violence, legal liability and ethical responsibility and suggests ways for them to be addressed. According to Agnes Callamard, Executive Director of ARTICLE 19, blogging plays an invaluable role in the free flow of information worldwide and is a true example of the democratisation of online publishing in the world. Like journalists and traditional media, bloggers also act as watchdogs, and they should be free and protected instead of silenced and imprisoned. Because blogger is very simple, because blogger is a human, because blogger is “freedom of expression”. Everyone, everywhere should be able to speak freely. As long as it isn’t causing harm to others, I don’t see why they can’t!